The angelic elixirs work directly in the DNA, to release matrices and restore fluidity and the possibility of pristine expression. Nothing changes until it is embodied and expressed in DNA. DNA is the basis for all that may express as faculties in you, which life then affirms to you… You are the central fractal pattern out of which your reality emerges, so as you refine the pattern, so your reality follows to greater harmonies and beauty. Russian scientists were able to genetically alter amphibians (having a salamander grow from a frog egg) through language. Their work was to demonstrate that DNA responded to frequency and intent (emotion and light). It is also known that positive emotions compress DNA–making it stronger and more robust, and available to activation. Negative emotions decompress it (to the point of destroying it) so that it cannot be activated through awareness (light and frequency). Every lie causes a fracture in the DNA, and the ensuing negative states create a magnetic distortion field around it. The human voice is the most powerful instrument of healing and activating mantra to the human body. Each strand or chamber of DNA that is expressed or activated (lived from) becomes another ‘filament’ of frequency in our voice, and so we literally ‘speak ourselves’ into ever greater evolution. It becomes an upward spiral of evolution. The angelic orders have given us hundreds of sound elixirs to open up the portals of consciousness within our DNA. When you listen to these elixirs, you are integrating new coding in the DNA without any effort on your part. These sound elixirs, sung by Almine, hold the light and frequencies of these mighty angelic orders that have been with us only since 2012. These elixirs are a true gift and blessings from the Infinite. Listening to elixirs daily is a way to bring about graceful destructing of what is obsolete and binding. The Angel Elixirs are designed to create alterations in the DNA, by preparing it for a more evolved level of living: the level of ‘pristine man’–no longer ‘fallen’–and the godhood level. 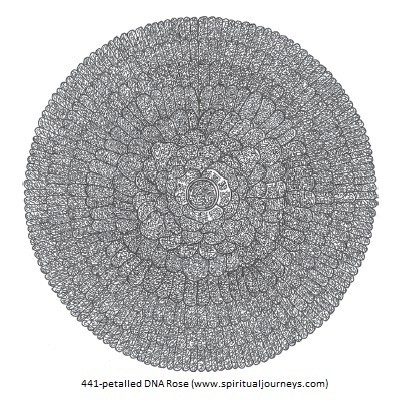 As we play them, the chambers of potential within the DNA (see the DNA Rose, pdf below) become stronger until they eventually express as new awareness and perspective. When that happens, the body’s faculties evolve and we behold a higher reality that becomes accessible to all. By proxy, as changes occur within those who receive these Angel Elixirs, it beneficially affects and restores all consciousness. The angels have revealed that 50% of our songbirds have disappeared and that the Angel Elixirs are able to bring them back; the more that we play them, the more it affects the species of the Earth. You become the living power to restore the animal and plant kingdom to its pristine nature. Imagine how this will affect body purification and its power to heal. As you embody and live their principles, the universe is in your debt, and you are blessed with higher consciousness. Higher consciousness attunes you to higher reality, which translates into greater potency and ease in life. When in overwhelm, anxiety, or moodiness of any kind, a powerful response is to pause and play at least one of the elixirs, and feel the tones in every part of the body. In time, you will notice life becoming more grace-filled. Below is a wonderful exercise to master, with support from the angel who helps you live the Song of Self, and reveal beauty unseen.